Amidst of all the fuss over USA involvement in Pakistani affairs and the presence of their security agencies in Pakistan we see denials from Pakistani officials for any such presence and interference but still people are not satisfied with government lies. Below is an article written by Jeremy Scahill of The Nation on the issue of Blackwater presence in Pakistan. links to put curbs on genuine journalism and news analysis. It reminds us of Musharraf’s emergency days when similar was done to stop the voices against their mistakes and crimes. Recent victim of this PPP government’s feudal martial law is “Meray Mutabiq” of Dr. Shahid Masood which has been banned by the Dubai government to go on air from Dubai. Recently government, agencies, government sponsored media and journalists have started a massive campaign against independent media and the elements and methods used were pretty much same as of Musharraf times even the allegations are similar like being paid by opposition or serving the foreign agenda (We all know our governments have been serving the foreign agenda not the independent media). We condemn this action of Pakistan and UAE governments and show our full solidarity with independent media. 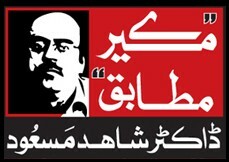 We expect the genuine journalists and analysts to continue their role which they have played against dictatorship, against emergency,against innocent killings and illegal abductions, against imperialist takeover of our country ,against NRO and corruption and the role to restore the independent judiciary of Pakistan. KARACHI: A ban has been imposed on airing of Geo News’ program ‘Meray Mutabiq’ from Dubai. According to sources, the high government officials of Pakistan exerting pressure on the Dubai government had the airing of the program stopped. Geo’s administration has said that this step of the government is tantamount to targeting the freedom of expression. It may be mentioned here that the senior analyst Dr. Shahid Masood was the anchor of ‘Meray Mutabiq’. NRO List and Government Stance–>The question here is of morality and social justice. 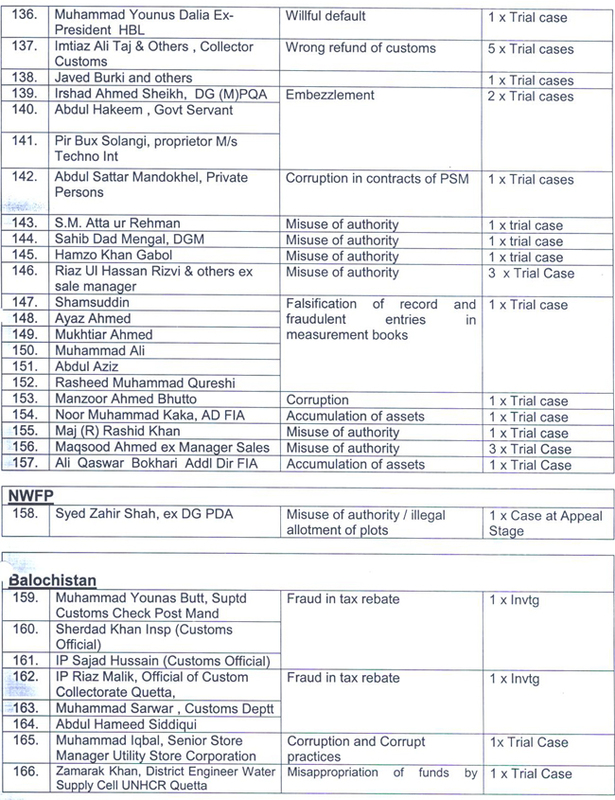 Finally the ever awaited list of National Reconciliation Ordinance (NRO) is out which has names of 8,041 beneficiaries out of which only 34 are politicians and rest are from bureaucracy , criminals, businessmen and other accused. There is a huge demand from various corners of the society to take resignations voluntarily or in voluntarily from the people who benefited from this law and are still serving in the government. The point of view of government as presented by federal minister for information and governor of Gilgit-Bultistan Qamar Zaman Kaira is that demanding resignations from NRO beneficiaries uncalled for. 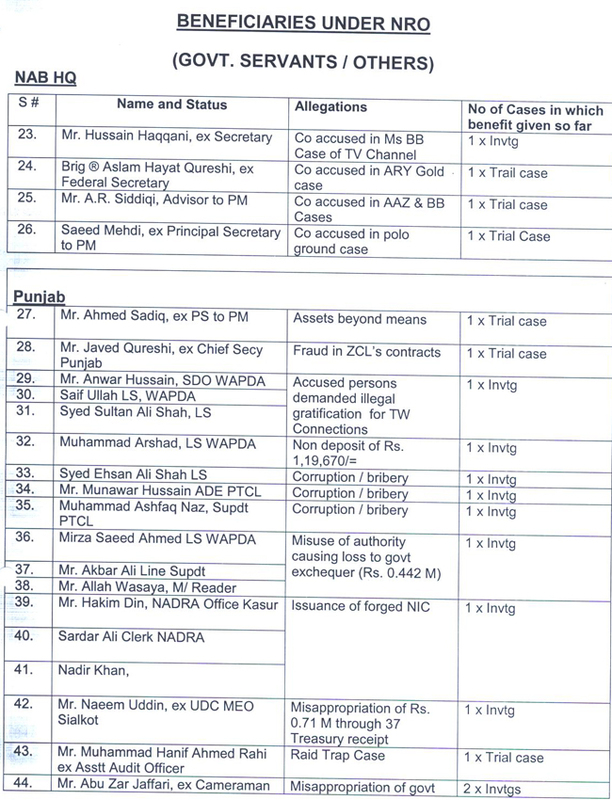 The reason he gives is one will have to differentiate between charges and crimes and that nothing has so far been proved against the NRO beneficiaries which on principle seems to be OK! 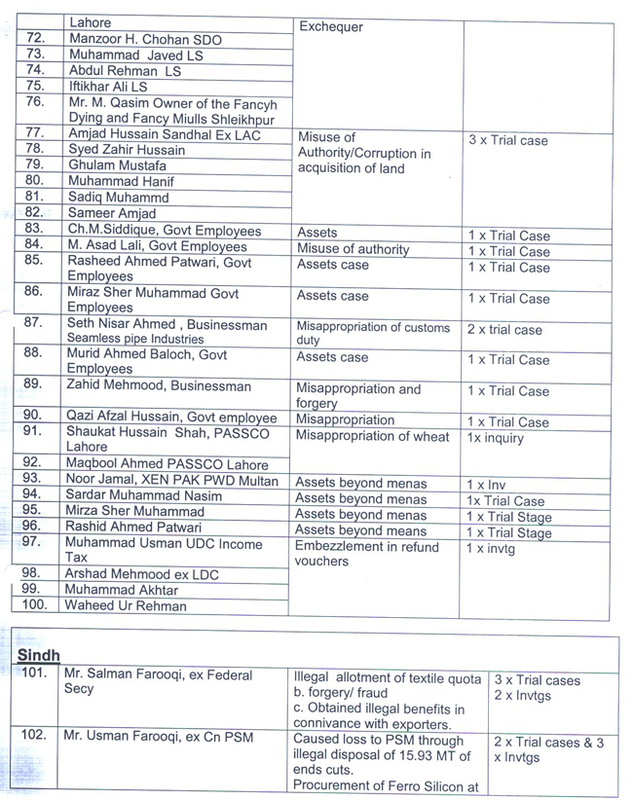 But can the information minister inform us about the pending cases and trials of common people in courts who have to justify their innocence before law to get acquitted and if the NRO angels where innocent then why they took refuge in a dictator’s shelter of NRO. The question here is of morality and social justice that why an elite group of people found it necessary to get a clearance certificate through a draconian law instead of facing the courts whereas a common man has to face years of trial to get justice. 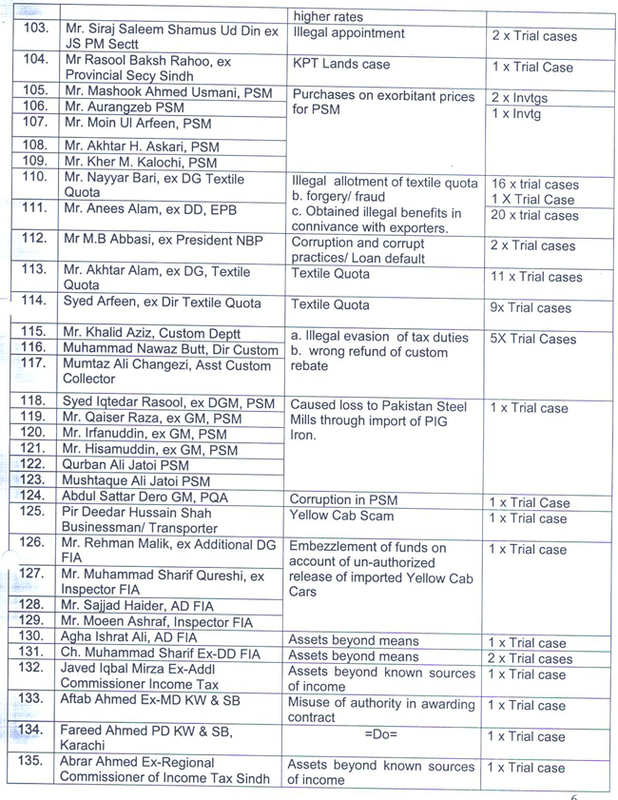 Still no full list of beneficiaries and cases is provided to the people and media. We also demand the list of people who got benefits from loan forgiveness or unfair settlements through corrupt political and banking practices. 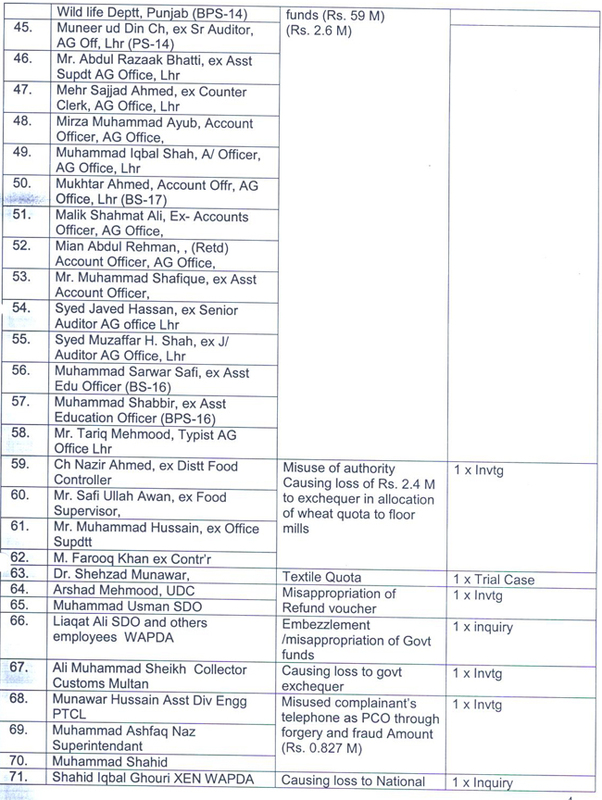 ISLAMABAD – List of beneficiaries of National Reconciliation Ordinance (NRO) released by Ministry of Law and Justice on Saturday took the top politicians of the state to task and perceived them as black sheep of the society. Some 34 politicians have been ranked first in the list of some 8,041 persons in terms of money, murders, attempted murders, balwa, embezzlement, corruption, malpractice, terrorism, kidnappings and other crimes of heinous nature. Keeping in view their massive embezzlements, these politicians seem to be heavy burden on the country that is already facing a severe financial crunch. The Law Ministry for the first time has brought the big fish to surface by releasing the list of country’s most corrupt people. “The notorious guns of malpractice of these black sheep which left the poor at the mercy of God had been used as common practice against the innocents since decades,” NRO list observed. 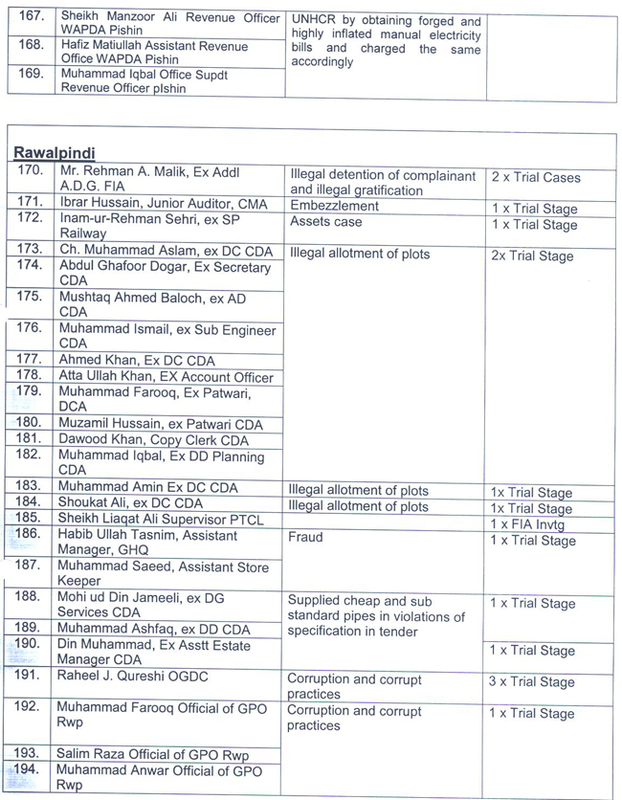 The top beneficiary of NRO is Altaf Hussain whose 72 cases including 31 murder cases were dismissed. 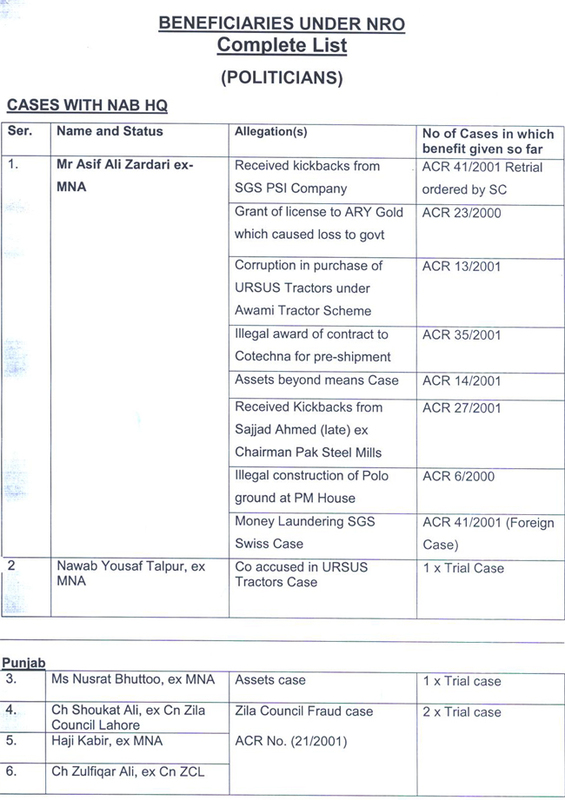 President Asif Ali Zardari had seven cases against him, while the number of Dr Farooq Sattar’s cases was 13. Most politicians had one to two cases against them. Madam Nusrat Bhutto, the spouse of Zulfikar Ali Bhutto, also heads over thousands in the notorious list. The MQM headed over other political parties whose workers hit the iron when it was hot. However, the PML-Q workers kept them away from that shoddy practice. 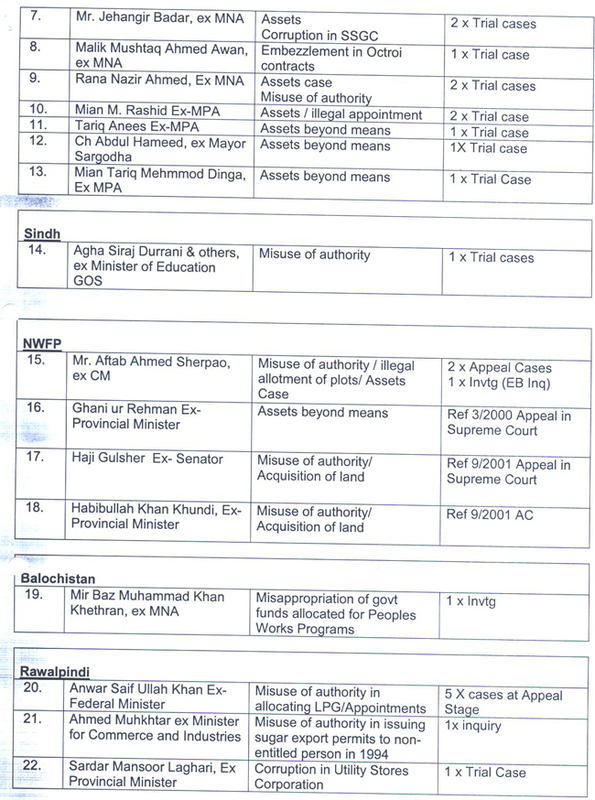 Addressing a press conference, Minister of State for Law & Justice Mohammad Afzal Sindhu on Saturday released the much-awaited list of the beneficiaries of NRO. The total number of NRO beneficiaries is 8,041 and 34 top politicians, 248 bureaucrats and three ambassadors are included in it, he told. “Corruption, embezzlement and criminal cases dumped under NRO will likely to be reopened, as the goose of the said ordinance will be cooked on November 28, 2009,” he said. Many stalwarts of the country’s political arena will fight legal battle in the courts as the top court of the country terms NRO null ab initio, he explained. Sindhu also announced a few important names in the list, which include President Asif Ali Zardari, MQM Chief Altaf Hussain, Begam Nusrat Bhutto, Federal Ministers Ch. Ahmad Mukhtar, Rehman Malik, Dr. Farooq Sattar, and Babar Ghori, Governor Sindh Dr. Ishrat-ul-Ibad Khan, Jahangir Badr, Anwar Saifullah, Yousaf Talpur, Ch. Shaukat Ali, Haji Nawaz Khokhar (late), Agha Siraj Ahmad Durrani, Mir Baz Kithran, Mushtaq Awan, Sulman Farooqi, Hussain Haqqani, Wajid Sham-ul-Hassan, A.R. 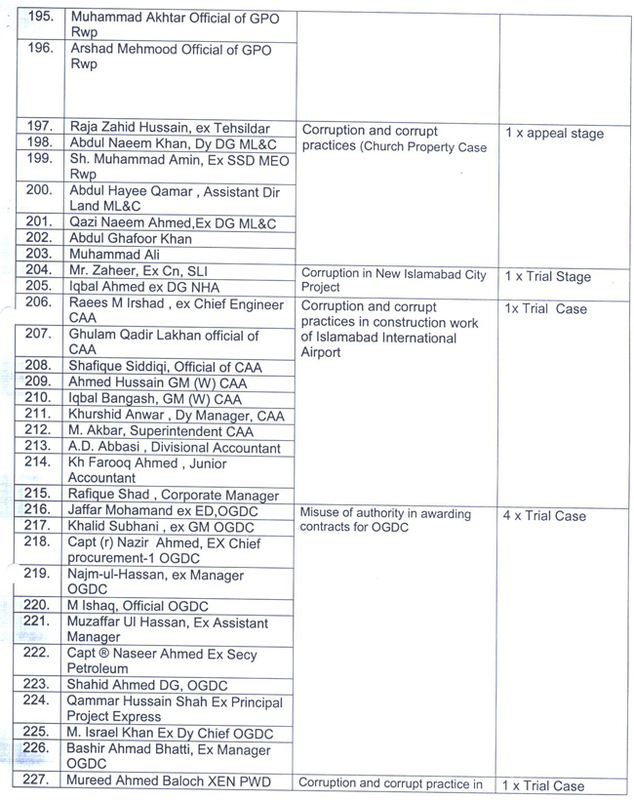 Siddiqui, Saleem Shahzad, Aftab Ahmed Sherpao, Mian Mohammad Rasheed, Tariq Rasheed, Tariq Mahmood, Sardar Maqsood Leghari, Ghani-ur-Rehman, Javed Ahmed Qureshi, Brig. (Retd) Imtiaz, Brig. (Retd) Aslam Hayat, Safdar Barqi and Saeed Mehdi. “Sindh is on the bottom line in the said list as some 7,793 people obtained relief under Article 2 of the NRO’s Review Board. The number of beneficiaries of the Review Board is 3,230,” he said. He said that neither Prime Minister Syed Yousuf Raza Gilani nor his wife had taken benefit under the NRO. “Prime Minister Gilani had opted to face the courts in the cases filed against him and he has been cleared by the courts,” he argued. The minister said that President Zardari had protection under the Article 248 of the Constitution and couldn’t be tried in any corruption or criminal case as far as he was the President of the state. “We will not protect anyone against the decision of the Supreme Court,” he maintained. The ruling PPP has taken decision that the judgement of superior judiciary would be accepted at all cost, he added. Advocating NRO beneficiaries, he said most of the cases were political vendetta and had been lingering in the courts for 10 to 15 years. “PML-N Quaid Mian Nawaz Sharif has himself admitted that Ehtesab Bureau of Saifur Rehman had initiated political cases against PPP leaders,” he added. The PPP would have to give credibility to the chief of a major political party, he remarked. The notorious NRO granted amnesty to politicians, political workers and bureaucrats who were accused of corruption, embezzlement, money laundering, murders and terrorism from 1st January 1986 to October 12, 1999, he emphasised. The State Minister for Law said the myriad corruption cases had been pending since decades, adding only one case was decided and after that three judges had to resign. Answering a query, he said NRO was brought in the Parliament at the direction of the Supreme Court and the verdicts of the higher judiciary would be respected in future as well. LAHORE – National Reconciliation Ordinance (NRO) is against the fundamental rights and letter and spirit of the constitution. The Supreme Court should start proceedings against the corrupt bureaucrats and politician who benefited from the ordinance. Judiciary till now is partially independent but it is hoped that it will assert its authority without bowing before any pressure. Justice (r) Wajihuddin Ahmed said this while addressing a news conference at Lahore Press Club on Saturday. He said it was expected that the judiciary would start proceedings at the earliest against those who looted the national wealth and got a clean chit from a military dictator under the NRO. He opined that Feb 2008 general elections were not fully representative as lawyers, civil society and a number of political parties had boycotted the process and the nation was now expecting midterm elections. “It is the responsibility of the Supreme Court to take up the petitions against the NRO beneficiaries on its expiry after Nov 28 deadline,” Wajih remarked, adding that it would be really difficult for the courts to open all the cases in absence of any proper prosecuting agency. He maintained that the time had come for the emergence of alternate political leadership at the national level from amongst the leaders of lawyers’ movement and civil society. About the immunity enjoyed by President Asif Ali Zardari, he opined that the constitution was like living organism while Article 248 being a its cancer body which give undue protection to the president and the governors. He demanded the apex court to abolish Article 248 from the Constitution as it was against the all the principles of justice and basic human rights. Claiming that the lawyers’ movement is still alive, he said its next target was to ensure rule of law and supremacy of the Constitution while helping the judiciary in playing its role for providing of justice to the masses. He hoped that an alternate leadership would come forward from amongst the lawyers to fill the gap of political leadership at national level. “Corruption is prevalent in lower judiciary as known means of income do not make with their (judicial officials) standard of living,” he said, adding that salary packages at the lower level should be increased. 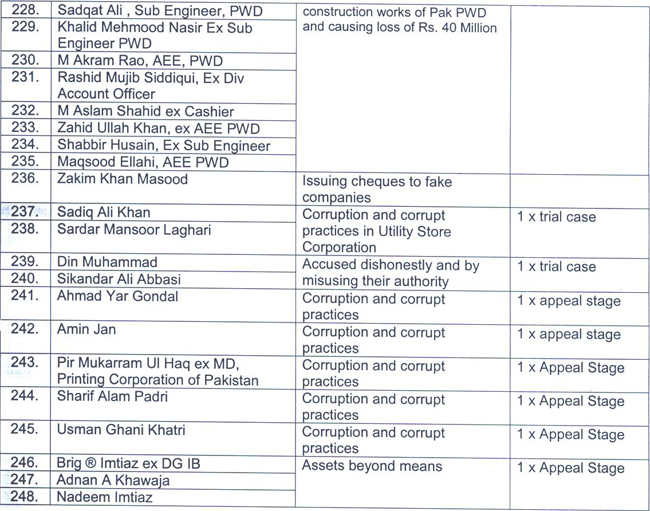 Wajih was of the view that because of absence of any check clerical staff of sessions and civil courts received bribes openly. He demanded amending the judicial policy and asked the higher judiciary to keep an eye on the state of affairs at the lower level. He also suggested making the budget of judiciary independent just like the army in view of sensitive nature of its work and claimed that it improve judges’ stature in the eyes of the public. Punjab University will remain closed from Friday Nov 27 to Monday November 30, 2009 on account of Eid-ul-Azha.